If standards and curricula seem balanced and fair, does that mean that subversives have done a good job of disguising their sneaky ideological poison? That has long been the accusation of conservative intellectuals. Leftist academics, conservatives have charged for decades, make their work seem neutral, while really injecting a biased and enervating leftism. We see this tradition alive and well in conservatives’ recent attack on the teaching of US History. As I noted in an essay in History News Network, Dinesh D’Souza’s new film warns that leftist teachers have taught America’s kids to hate America. Apparently unconsciously, these conservative critics are echoing a long tradition of conservative educational thinking. 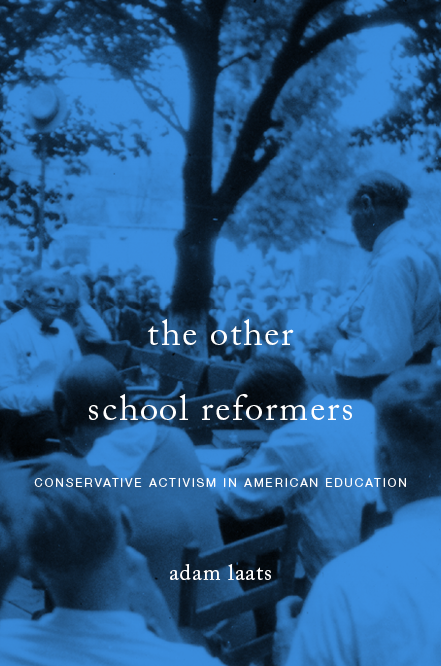 As I argue in my upcoming book, throughout the twentieth century conservatives warned that schools were being led in leftist directions, often by this same sort of sneaky subversion. The leftists were so sneaky, conservatives warned, that readers might not even notice their subversion. In the 1939-1941 conservative campaign against Harold Rugg’s social-studies textbooks, for example, critics warned that unwary readers could be duped into thinking the books were balanced and fair. One coalition of conservative activists called the books’ leftism “extremely clever.” Instead of openly proclaiming their leftist bias, Rugg’s books led children “with gentle language and a pedagogic smile . . . through the successive stages of indoctrination.” These conservatives conceded that many readers might find nothing wrong with Rugg’s books. But that only meant, they warned, that the danger was that much greater. This sort of obvious-only-to-the-initiated analysis of leftist bias seems a double-edged sword. On the one hand, it presents conservative intellectuals with a difficult task. They must convince readers that even seemingly balanced curricular material is secretly anti-American, secretly leftist. That’s a tall order. But when school subversion is embedded cunningly within seemingly neutral material, conservative intellectuals are able to explain why so many popular textbooks and curricula have prospered in spite of their leftist implications. Are the new APUSH materials really biased? Try it. Read the new curriculum guide. Does it seem like a biased leftist document to you? Its makers didn’t think so. But does that prove that conservative intellectuals are paranoid? Or does it show, rather, that the educational establishment is so dominated by left-leaning academics that they don’t even notice their own bias? What should liberal-arts colleges teach? The conservative National Association of Scholars warns that elite schools such as Bowdoin have mutated into anti-liberal-arts indoctrination centers. Instead of guiding students through the rigors of arts and sciences, NAS suggests, schools such as Bowdoin train students only to mouth hackneyed slogans. Instead of guiding students through the difficult work of mastering an intellectual tradition, Bowdoin sends its professors off to conduct research and releases students to wander in an intellectual meadow. Bowdoin is not the first college to come under criticism from NAS recently. The conservative higher-ed association also published a study of the ways American history is taught at the University of Texas—Austin and Texas A & M University. At those prestigious schools, NAS concluded, an ideologically slanted focus on race, class, and gender had supplanted traditional interest in diplomatic, religious, and political history. The kerfuffle at Bowdoin had its roots in an awkward golf game. Thomas Klingenstein, who calls himself a “conservative” “Wall-Streeter,” described his golf game with Bowdoin President Barry Mills. Mills had told a Bowdoin audience that they needed to address the problem of liberal bias on Bowdoin’s campus. Too many of Bowdoin’s graduates, Mills suggested, would otherwise never be able to make sense of this “Glenn Beck, Sarah Palin moment in our history.” Klingenstein accused Mills of understating the problem of liberal bias at Bowdoin and many other schools. As a result of this “civil” disagreement on the links, Klingenstein supported the NAS inquiry into Bowdoin’s ideological slant. The first is to provide an accurate, vivid, and up-to-date account of what Bowdoin attempts to teach its students. The second is to analyze whether that teaching has been compromised by contemporary ideology. . . . Our third purpose is to look at elite higher education in America using Bowdoin as a representative example (pg. 14). the autonomous authority on the content of his education. Having turned the student into a consumer with complete freedom of choice, it became insurmountably difficult to declare that the college itself had both the better insight and the authority to require students to meet some substantive general education requirements (pg. 356). Compounding this problem, research needs of the faculty came to overshadow faculty teaching requirements, the NAS report concludes. In the end, the study argues, Bowdoin gives “privileged prominence to some political ideologies and squelches opposition to those views” (358). Instead of true diversity, Bowdoin embraced a deeply flawed interpretation of the laudable intellectual goal of “critical thinking,” according to the NAS study. All students will be drilled in such shibboleths as “The importance of diversity, respect for ‘difference,’ sustainability, the social construction of gender, the need to obtain ‘consent,’ the common good, world citizenship, and critical thinking” (359). But such notions, often worthy in themselves, were not part of a process of “open debate.” Bowdoin students, instead, learn to repeat mantras and “certainties on some of the most contentious issues of our time” (359). As a result, the NAS study warns, “When critical thinking is most necessary, it is most absent” (359). Intellectual modesty. Self-restraint. Hard work. Virtue. Self-criticism. Moderation. A broad framework of intellectual history. Survey courses. English composition. A course on Edmund Spenser. A course primarily on the American Founders. A course on the American Revolution. The history of Western civilization from classical times to the present. A course on the Christian philosophical tradition. Public speaking. Tolerance towards dissenting views. The predicates of critical thinking. A coherent body of knowledge. How to distinguish importance from triviality. Wisdom. Culture (pg. 360). Ouch. Not just Bowdoin, but liberal-arts education as a whole stands accused. We can be certain that defenders of Bowdoin’s vision of education will soon offer a rejoinder to this conservative broadside.